As one school year closes and we have a little time to breathe and make plans for another. A little while back I began to collect a list of my favorite discoveries for engaging in global connections and participation for my pre-service grad students. Here’s the growing curation and below are a few highlights of the opportunities that range from simply sparking a degree of global awareness to fully emerging in meaningful projects and connections with potential for both personal and global impact. iEARN: The non-profit made up of 30,000 schools and youth organizations offers more than 100 searchable interactive curriculum-based projects, in a variety of languages where students can safely collaborate, create, research, and share opinions, on their way toward becoming global citizens. Every iEARN project must help answer the question, “How will this project improve the quality of life on the planet?” Check out the Teachers Guide to Online Collaboration and Global Projects and as well as the helpful tutorials. The World’s Largest Lesson introduces the United Nations’ 17 Sustainable Development Goals–the world’s to-do list to end poverty, reduce inequalities and tackle climate change–to children and young people everywhere. And it is designed to unite them in a variety of potential actions. Instructional tools include introductory lessons and resources for assemblies, a collection of comics. a Goal 5 Gender Equality Project, Plate Pioneerz on malnutrition and obesity. You’ll also find the Educator Training Course, Templates and Logos, Classroom Decorations, Social Media Tools and tools for Student Action. SDGs in Action App: The free app, also based on the United Nations’ Sustainable Development Goals, presents information about all 17 goals, including targets, videos, facts, data, news, notifications, and the ability to discover local actions and events. Google Lit Trips: Using Google Earth, these downloadable files share the journeys of famous literary characters. Select from among a large variety of pre-made trips or create your own. As you follow a character’s journey, you’ll encounter placemarks with pop-up windows offering supplementary information, media, links and thoughtful discussion prompts. The Global Digital Library, is an open platform being developed by the Global Book Alliance to increase the availability of high-quality reading resources in underserved languages worldwide. While the focus is on storybooks and books for instruction, the GDL will also share such interactive resources as literacy games. By the end of 2020, the library hopes to offer resources in more than 100 languages and to further facilitate their translation. The Norwegian Agency for Development Cooperation (Norad) is the leading force behind the international project, with content provided by: Bookdash, Asia Foundation’s Let’s Read, Storyweaver, African Storybook Project, USAID missions, All Children Reading: a Grand Challenge for Development, URC, and the Global Reading Network. Google Expeditions: engage learners in virtual reality field trips by purchasing or building a kit and by downloading the Expeditions App. Check out the resources in Google for Education’s Teacher Training Center and this searchable list of Expeditions. Flipgrid and beyond: I’ve been using Flipgrid to connect my students with each other and with others and to share stories for what seems like a very long time now. Many of us are discovering that the connections can be global and that Flipgrid might be used to increase social learning, global empathy, and cultural understanding. FlipGrid Global Connections emerged as a space to share collaborative projects, and CoPilots was introduced to facilitate managing your grids with partner educators. These connections allow for all types of cultural sharing penpal or GridPal-style. In Global Connections, you can set grade levels, subject areas and goals. Empatico: Aimed at first through fifth grades, this KIND Foundation initiative’s mission is to offer kids the chance to explore their similarities and differences, expand their horizons and strengthen their empathy muscles. The free, standards-aligned tool matches classrooms globally and allows teachers to connect using seamless video conferencing technology. ISTE’s Global Collaboration PLN (you must join to access resources) promotes digital collaboration beyond classroom walls with such resources as best-practice curriculum design and a community sharing tools and methods, curriculum developments, and opportunities for collaborations. While the annual Global Education Conference has just wrapped up, well known global educator Lucy Gray (@elemenous) continues to share Global Ed Conference Resources (register first to access) and you’ll want to follow @globaledcon). Lucy also maintains and Evernote Notebook of Global Education Resources and a Twitter list of people and organizations promoting global awareness, as well as her Paper.li curation, High Expectations Daily. #Globaledchat: Join a group of international educators for a live Twitter chat on global education topics every Thursday at 8 PM Eastern as well as regular postings. Asia Society Center for Global Education: includes a wealth of resources on making the case for and teaching for Global Competence. Among the goodies are pages of instructional resources as well as reasonably priced courses. Design Squad Global is a 6- or 12-week club experience devoted to encouraging students to explore engineering and invention with international partners. The PBS STEM initiative, matches middle school age clubs around the world for collaborative, locally-relevant, hands-on, standards-aligned activities. Check out these inspiring videos helpful for DSG and beyond! FieldTripZoom uses the popular Zoom conferencing platform to foster increased, live interaction between our educational content partners, educators and students with the goal of making live video-based experiential learning or “virtual field trips” a common, consistent part of your curriculum. There’s a catalog of more than 500 experiences designed for specific ages and curricula for both school and homeschool settings. Here’s a list of FieldtripZoom contributors who engage in the live streaming experiences. 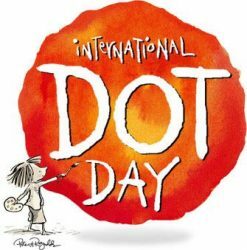 International Dot Day Mid-September every year (usually September 15th), millions of students and educators around the world participate in celebrating creativity. Simply sign up on the website, get inspired by reading or re-reading Peter H. Reynold’s The Dot and consider the many ways you might make a mark and connect with others. Imagine the power and potential of millions of people around the world connecting, collaborating, creating and celebrating all that creativity inspires and invites. I hope you will join the growing global community of creativity champions using their talents, gifts and energy to move the world to a better place. Language differences are becoming less of a barrier. Skype Translator now allows for the real-time translation of voice and text conversations over Skype. The Voice translator can currently translate 10 languages–English, Spanish, French, German, Chinese (Mandarin), Italian, Portuguese (Brazilian), Arabic, and Russian. The text translator can currently translate more than 60 for clear, seamless instant messaging. New languages are being added regularly. You can check the list of supported languages here. The Google Translate App can translate text between 103 languages by typing and offers instant camera translation for 38 languages and photo translation for 37 languages and it can translate bilingual conversations on the fly for 32 languages. Here’s an introduction to the Tap to Translate feature. ePals, supported by Cricket Media, offers strategies for connecting learning partners around the world. Teachers can search by country, language, age group, language, subject. You may also choose to join an Experience, or global project for target ages, subject or type of experiences. There are also engaging Challenges to enter. And individual students can set up their own teacher-moderated pen pal exchange. Google Science Fair: is an international, online science and engineering competition for students ages 13 to 18. It is designed to champion a new generation of innovators by encouraging young people to change the world through scientific inquiry and problem-solving. Keep an eye out for new material regarding the Fall 2018 competition, but in the meantime get your starter kit and check out the inspiring past projects, interviews with scientists and these posters inspired by past young winners. The Global Read Aloud: Created by Pernille Ripp in 2010, this annual fall event continues to inspire with more 4,000,000 students from more than 80 different countries participating. Participants sign up to read the same book aloud to their own students and then choose platforms on which to connect during the six weeks of the project. One World Classrooms: students share their art with students around the world and use Voicethread to communicate with partner classrooms. Flat Connections: Julie Lindsay offers a “call to action” for educators, inviting them to engage in a range of global projects and discussions around how they might be integrated into curricula, recommendations of tools that support online connection, communication and collaboration, strategies for designing learning, strong rationale to make your case, projects, courses, Online Global Collaborative Learning Playbooks, and so much more. Global Youth Debates: This Flat Connections global project, for ages 10 through 18, provides a unique global collaborative experience for joining diverse cultures in authentic debate to foster global competence, international mindedness and action. A new debate topic will be announced for the fall. Check out the protocols for this exciting international debating experience that make use of new methodologies to connect, communicate and collaborate have made asynchronous formal debating possible globally. Also check out some of the archived Best Debates. The Global Art Project for Peace: occurs biennially in April. Its mission is to joyously create a culture of peace through art. The Project celebrates diversity and multi-culturalism while expressing the idea: We Are All One. Quadblogging: Launched in 2011, this exceptional project = has engaged students in more than 65 countries in blogging together. Participants are allocated a Quad containing four classes including your own, each with a Quad Co-ordinator. Classes rotate responsibility for being the “focus class” each week with the other three classes visiting and commenting. Geoguessr: In single player or challenge mode users navigate and analyze Google Street View panoramas from around the world for clues trying to determine where they are. The closer your guess, the higher your score. Though the appearance of the maps are “semi-randomized,” you can check out some of the games in these categories: World maps, Famous places, United States, European stadiums, Famous places all over the world, US cities , the Arctic, lost in Russia. Check out this post from 2013 relating my high school students’ experience of playing with Shannon Miller’s experienced 4th graders. If you enjoy geography games, check out Google Earth’s new Global Trivia, multiple choice quizzes to test your knowledge of natural wonders near and far. Nepris: This matchmaking service connects classrooms with industry experts to expand their learning, allowing companies to an effective way for companies to extend education outreach and create equity of access. I am planning to continue to build this little curation of projects and resources for connecting learners and inspiring partnership well beyond classroom and library walls. Please remember that we are trying to launch our own hashtag to foster global collaboration. If you are seeking a partner on social media, consider using the new #inTLchat hashtag.